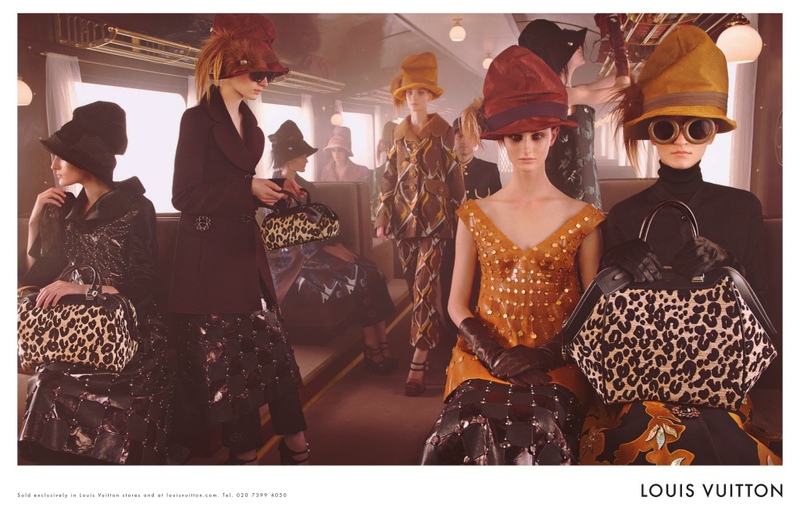 Louis Vuitton is back and the girls are still on the train. But this time there is a distinct 60’s/70’s vibe. It’s smokey, the girls have purpose and the colours are a bit of a mustard invasion. And they are still wearing hats that are all kind of stupid. I do love that Louis Vuitton has continued the train theme. Partly because I LOVE TRAINS. But also because in looking at the two adverts you get a lovely timeless feeling about train travel. There have been no major changes in train travel over the last few decades (Oyster card excluded), and these adverts show that perfectly. Travellers are locked in their own private worlds, focussing on the day ahead, and (in the world of Louis Vuitton at least) looking fabulous while doing so. What I would love to see, is the next season of Louis Vuitton adverts in the present day – or at least using clothes with a harsh edge to mimic modern fashion. It would be a complete circle of train love. I saw this campaign in the latest Vogue magazine – it is SOOO beautiful! Its really evocative of a time when people actually dressed up to travel. Nowadays, we mostly go for comfort over style on long-haul jaunts. Perhaps that’s why the focus on the years of old, rather than the modern traveller? Would be an interesting way to approach a new ad though, for sure! So true, I would love to see if the London Underground could be made to feel glamorous. Although if anyone could manage it, it would be LV.